ATHENS, Jan. 23, 2015 - Greek Prime Minister Antonis Samaras (C) and Chinese Ambassador to Greece Zou Xiaoli (1st L) cut the ribbon during the starting ceremony of the expansion of Pier III of Piraeus port in Athens, Greece, Jan. 22, 2014. 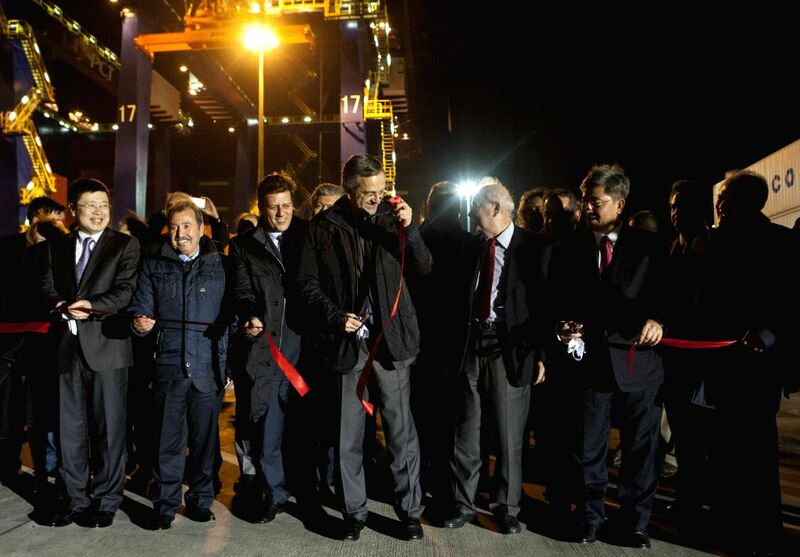 Antonis Samaras on Thursday inaugurated the expansion project of Piraeus port's Pier III run since 2009 by Piraeus Container Terminal (PCT), a subsidiary of Chinese shipping conglomerate COSCO. The upgrade will increase the annual capacity of PCT to 6.2 million TEUs from 3.7 million containers in 2014.